waters that hide saltwater crocodiles to areas of monsoon rainforest within the towering escarpments, Kakadu’s landscape is one of the most diverse in the world. More than 1000 species of plant, one third of Australian bird species, and a quarter of all Australian freshwater fish species are to be found here. The name ‘Kakadu’ comes from the Aboriginal ‘Gagudju’ and I believe that means ‘crocodile’! We took the Arnhem Highway into Kakadu and stopped for lunch at the Bark Hut Inn at Annaburroo, an historic icon approximately halfway between Darwin and Kakadu. The Mary River wetlands and Rock Hole billabong are close by and the inn offers accommodation and other facilities for those who want to explore the area. There was a tour bus parked outside when we arrived and the driver was in the mood to chat while he waited for his passengers. He very kindly told us of some of the best places to see and, more importantly as far as John was concerned, where to catch the best fish. Jabiru, the hottest place I’ve ever been! Armed with this knowledge, we continued along the highway towards Jabiru. Established in the 1970’s as a mining town, the present town was completed in 1982. It was modelled on Canberra and named after Australia’s only stork. And it is most definitely the hottest place I’ve ever been! We arrived at the Kakadu Lodge Caravan Park ([star][star][star][star]) in Jabiru at a little after 3:00, stepped out of the car (and the air conditioning), and almost melted. I could not believe how hot it was. I thought this was supposed to be the winter! Setting up camp didn’t take long and I wanted to explore the town. Where’s the boat ramp at Lake Jabiru? asked where the boat ramp is only to be told that there isn’t one; boats are not permitted on the lake. Many comments sprang to mind but I kept my lips sealed. It wasn’t easy, though! We returned to camp for our ‘first night bubbly’ ritual with our bottle of Two Tails Sparkling Wine and later on went for a swim in the absolutely amazing pool. Designed like a beach, it is complete with spa and waterfall and is right beside the bar and bistro. Dinner, a glass of wine, and a dip in the pool; what more could we ask? The sun set in a stunning display of colour and darkness settled over the camp and it wasn’t long before I was heading off to bed but during the night I thought I heard a dog barking. This is a national park; I must have been dreaming. expected a quiet Sunday here in the park but we discovered that Kakadu Air operates some terrific scenic flights out over the Arnhem Land escarpment and this is quite possibly the only way we would ever get to see this beautiful piece of Aboriginal land without a permit. Having flown in a fixed wing aircraft at Uluru, this time we opted for a helicopter and I was quite excited at the prospect. Arnhem Land, like Kakadu, is a magnificent vista of diverse and ever-changing landscapes and not at all what one expects. The advertising blurb stated that a scenic flight over this timeless land would change your perception of it. It’s not wrong. 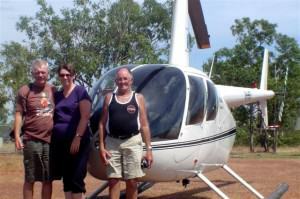 We took off from Jabiru Airport and immediately turned to fly over the Ranger Uranium Mine. Uranium deposits were discovered here in 1969 by a couple of geologists who had detected some radiometric anomalies during one of their airborne geological surveys. Over the next 2 years several bodies of ore were detected. Energy Resources Australia operates the Ranger mine and commercial production of uranium has been under way since 1981. There were some pretty strong winds aloft and our pilot did a good job of keeping us steady and I think he realised that the mine held absolutely no interest for me because it wasn’t long before we were leaving it behind and heading for Arnhem Land. and is home to about 16,000 people. The Gove Peninsula, situated at the far north-eastern end of Arnhem Land is one of the last true wildernesses. This land, untouched and rarely visited by white people, is breathtakingly beautiful and we could well understand why the Aboriginal people fight so hard to preserve its pristine condition. Not a dinosaur in sight! We circled over Dinosaur Valley and Magela Gorge and were stunned by the extraordinary erosion of this area, the sharpest of sharp contrasts with what we’d seen of Arnhem Land so far, this is an area that can only be seen from the air, and really only by helicopter. I was glad we came. On the way back we had a 25-knot tailwind and it seemed to take only a few minutes before we were landing back at the airport. We collected our gear from the check-in counter (bags, glasses, hats etc are not permitted in the helicopter for safety reasons) and left the airport after the requisite photo call. 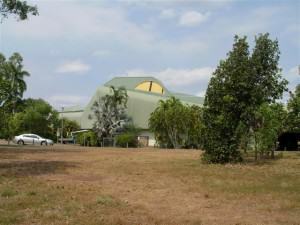 The Bowali Visitor Centre has a wealth of information about Kakadu, along with a souvenir shop and a café. We drove out there from the airport with the intention of having a bite to eat for lunch and spent the next couple of hours wandering through the gallery and the displays. 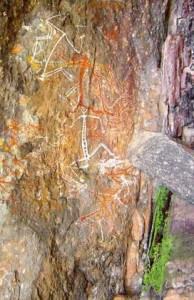 “Bowali” is the Aboriginal name for the local area and creek on land owned by the Mirrar clan. The galleries are remarkable and very informative with audio/visual presentations that give different viewpoints on Kakadu. We discovered in our wanderings that the “little dog” we heard barking at night is actually a barking owl and it does sound remarkably like a dog. So I wasn’t dreaming! 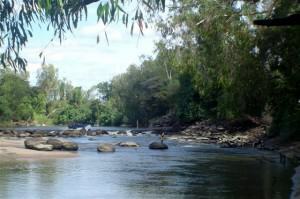 By the time we left Bowali I was about ready for a quiet afternoon but John and our travelling companion, Robert, wanted to go fishing and so we drove out to the East Alligator River and Cahill’s Crossing, in the shadow of the Arnhem Land escarpment. We drove upriver a little ways where the Guluyambi river cruise departs and spent some time talking with one of the guides. He told us that there is a very big saltwater crocodile about every 100 metres (328 feet) along the bottom of the river with a few smaller ones and some freshwater crocodiles scattered between them. Never make the mistake of thinking that there aren’t any there, he said. Words I took to heart! heeding those warnings and taking extra care although at one stage Robert was right on the edge of the water. One of the locals suggested that he might want to move back from the edge. The river is actually the boundary to Arnhem Land and we were watching some indigenous people fishing on the other side. Now they really know how to catch fish. One lady we were watching was using a hand line and she hooked a small black-tipped shark, dragged it up onto the beach, and then walked away and left it. But she didn’t abandon her catch; she returned after a few minutes with a branch off a tree and proceeded to beat the thing to death! I was beginning to feel sorry for the shark! When the sun started to go down we returned to camp. The last thing we wanted was to be on the boat ramp at dusk when the crocodiles are usually feeding. We had a drink at the bar before dinner and, after dinner, another swim in the pool. This is the life! And tomorrow was another day. The next day dawned and by the time we had finished breakfast it was already hot, hot, hot! I am so over this weather! An endless stream of 40°C (104°F) days is not fun! We decided to explore a little farther afield today and drove out to Nourlangie. quite beautiful, each one telling a story, and most of them thousands of years old. 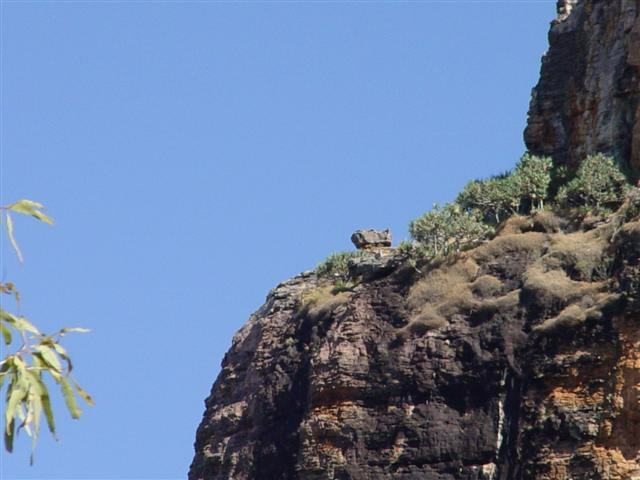 The 1.5 kilometre (about 1 mile) circular walk passes several outstanding art sites and even an ancient Aboriginal shelter. One of the sites even shows a drawing that certainly gives credence to those stories about aliens visiting us thousands of years ago. Most of the drawings are amazing in their detail but, like at Uluru, some are definitely the worse for wear, so to speak. Rock art is an important historic record of human habitation in this region and some of the paintings are extremely fragile. There are many constructed boardwalks around the galleries to protect the paintings from large animals, including people. taken from his headress by his sister after they had broken the laws. There is also another Dreamtime story of the Rainbow Serpent, who created passages through rocks and formed waterholes in Kakadu. The Rainbow Serpent is a powerful ancestor and is known by Aboriginals throughout Australia. The walk took about an hour and when we returned to the car we thought we might like to visit Anbangbang Billabong, one of the most beautiful waterholes in Kakadu, but it was still closed from the wet season. We discovered today that many of the places we want to see are still closed, unfortunately. The wet season is also the crocodile breeding season and the last thing you want to do is disturb one of those things while he’s “busy” – or even when he’s not! 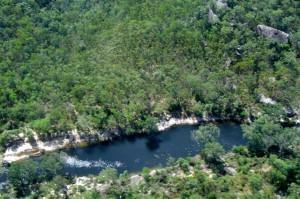 The Yellow Water region is one of Kakadu’s best known landmarks. The world famous wetlands, the most beautiful we have ever seen, are part of the South Alligator River floodplain. Located near the small settlement of Cooinda, Yellow Water is home to a wide variety of wildlife, including crocodiles. 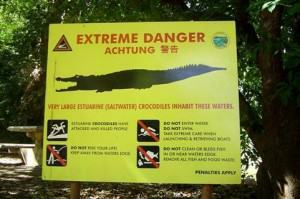 By now we were looking for somewhere to have lunch but we couldn’t stay at Yellow Water; there are no safe picnic grounds to stop at and severe warnings of extreme crocodile danger. We wanted to HAVE lunch, not BE lunch. Gagudju Lodge is located at Cooinda and we decided to have our picnic lunch in the grounds of the resort before continuing on to Jim Jim Falls and Twin Falls Gorge. 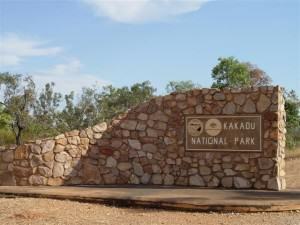 south of the Bowali Centre along the Kakadu Highway and then 60 kilometres (38 miles) from the highway along a track that is suitable only for 4×4 vehicles and only in the dry season. It’s quite a trek and I was bitterly disappointed to discover that the track was still closed from the wet season. I was so looking forward to seeing Jim Jim Falls, at least but, as John pointed out, it wouldn’t do to come face to face with a “saltie”. Even the hotel looks like a crocodile! Before returning to camp we stopped briefly at the Gagudju Crocodile Hotel, shaped to resemble the mighty predator that inhabits the Top End. From the ground we couldn’t photograph the whole of the hotel but I did manage to get the “head” and one “eye”. We returned to camp for a quiet afternoon and to catch up on a few things but the heat was oppressive. There were storm clouds gathering in the distance and I hoped we might get something from it. Later in the afternoon the wind came up and the temperature dropped about 10° but no rain fell. By 7:00 the next morning, it was already heating up to what would be another hot day as we set out to explore a bit more of this remarkable place. Along the sides of the highway are many thousands of magnetic termite mounds, quite a lot of them over 2 metres (6½ feet) high. These fascinating insects build their mounds aligned north and south to minimise exposure to the sun and maximise temperature control. 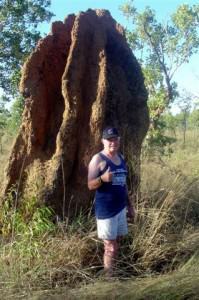 They may not be the most intelligent little creatures in the world but termites are certainly smart! We stopped briefly at Muirella Park thinking that we might head down to Sandy Billabong but that road was closed too and so we continued on down the Kakadu Highway. The highway stretches 200 kilometres (124 miles) from Jabiru to Pine Creek, three quarters of the distance is inside the national park. Pine Creek was established in the late 1800’s and is the Top End’s only remaining original mining town from the 1870’s gold rush. 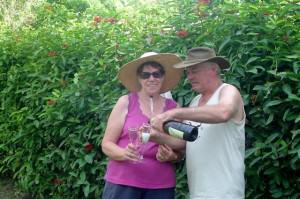 We stopped at Mayse’s Café there for a cup of coffee before heading back to Jabiru. I have to admit that it wasn’t the best coffee we’d ever had but it was good to get out and stretch the legs for a while. 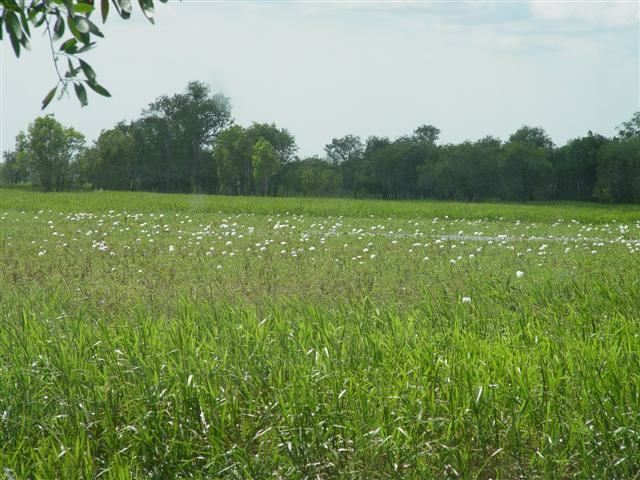 Our last day in Kakadu, we explored the town of Jabiru, not that there was much to see, but it was interesting nevertheless. The design of the town is such that it blends in with the natural environment as much as possible. It’s small but it does have a shopping centre that includes banks, supermarket, and post office. The town even has a golf course. 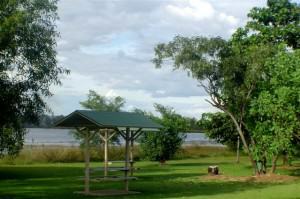 We had a picnic lunch beside Lake Jabiru before returning to camp to begin packing up. To really see and appreciate Jabiru and Kakadu National Park would take more than the few days we had here. The phrase “jewel in the crown” is understating that magnificence of Kakadu. There is no place on Earth quite like it and if you only visit one region in Australia, it really should be Kakadu.